Tansee iPod Copy Pack - Copy songs/videos/photos from iPod to computer. Tansee iPod Copy Pack is a life saver when - Sending your iPod for repair - Backup songs/videos/photos to a new PC - Moving to a new iPod - Computer crashed - Share your iPod songs/videos/photos with friends - Copy all songs/videos/photos to a new iPod Tansee iPod Copy Pack is an all-in-one iPod copy solution. This Pack includes 2 software -- \"Tansee iPod Transfer $19.95\" and \"Tansee iPod Transfer Photo $19.95\". 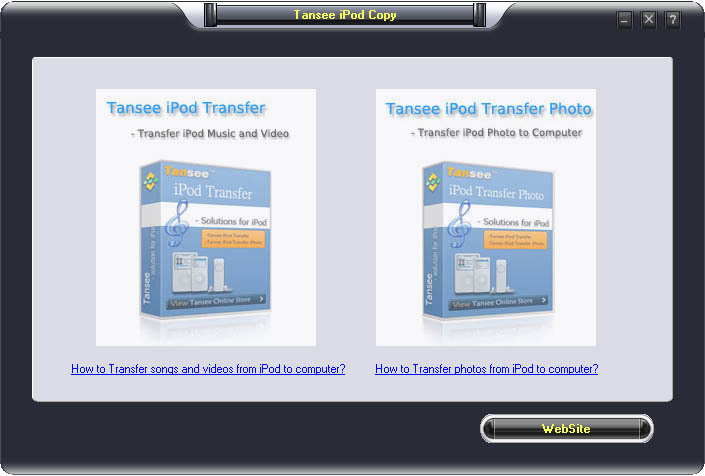 Now you can get this Tansee iPod Copy Pack at a very competitive price $29.95! Save $10! Tansee iPod Copy Pack is the ultimate backup tool for your iPod. It enables to easily copy your iPods songs/videos/photos to your PC. Whether you need to send your iPod for repair, retrieve your songs/videos/photos because of a computer / hard drive crash, or just to backup to a different drive, Tansee iPod Copy Pack will create an iPod copy effortlessly. Contact & Other Software of Tansee Inc.